Suddenly it’s really spring in Columbus. Is there severe weather headed to Columbus soon? If there is, there’s an app for that! The image was the sign on a door in a downtown Columbus residence at City Hop 2011. 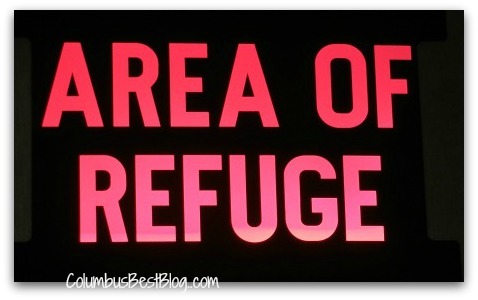 “Refuge” an area for residents to take cover in storms. It started sprinkling when I was leaving Powell early this afternoon. We were talking about thunderstorms as we left the HER Realtors office after a meeting. “Follow the instructions of state and local officials and listen to local radio or TV stations for updated emergency information. If a warning is issued, get indoors, and move to the center of an interior room on the lowest level (closet, interior hallway) away from corners, windows, doors, and outside walls. I put an app on my Android phone. I found it searching the Play Store for FEMA.